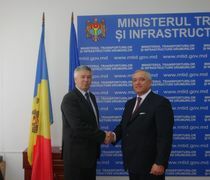 On 8 April 2015 in the National Secretariat of the IGC TRACECA in Moldova Mr. Mircea Ciopraga, Secretary General of the PS IGC TRACECA met with Mr. Andrei Cuculescu, National Secretary of the IGC TRACECA in Moldova and other related representatives in transport field. The main subject of the Meeting consisted in the discussion of proposals and visions regarding further institutional transformation of TRACECA into international organization. The National Secretariat of TRACECA in Moldova expressed its readiness for legal assistance at the expert level and assured the Secretary General of TRACECA in its support for transformation. Mr. Mircea Ciopraga, TRACECA Secretary General touched the issues of the status of the implementation of ongoing EC technical assistance projects in aviation, road and maritime fields as well as financing of the TRACECA Programme and projects. With the view of comprehensive elaboration of TRACECA development strategies Mr. Ciopraga emphasized the necessity of creating a Working Group to include the relevant experts of TRACECA member-states of the MLA TRACECA as well as Moldavian experts. The Parties underlined the significance and necessity of the continuation of the regional EU technical assistance projects for the TRACECA member states attracting experts from related transport authorities, subject to the country’s needs. 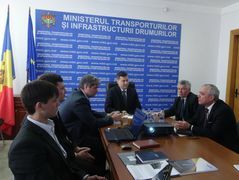 During the meeting Mr. Cuculescu briefed Mr. Ciopraga on the stage of development of transport fields in Moldoda. In particular, they talked about the development of water transport in the Republic of Moldova, the Giurgiulesti port complex and its technical capabilities, as well as future plans for the effective functioning of the country's transport system.